To end our series on memorials in London commemorating the Great Fire of 1666 – marking the event’s 350th anniversary – we’re taking a look at what is one of the smallest monuments in the City (and, despite all rumour, possibly not a memorial to the Great Fire at all). 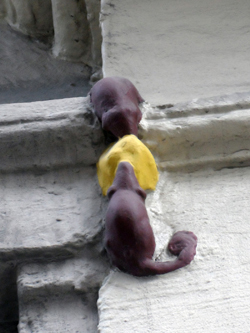 Midway up the wall of a building at the corner of Eastcheap and Philpot Lane, not far from The Monument (for more on its history, see our earlier post here), can be seen two brown mice fighting over a piece of cheese. The mice are commonly said to be a memorial, not to anyone who died during the fire, but to two men who died while building The Monument itself. The cheese apparently relates to the story in that the two men fell to the deaths while fighting after one accused the other of eating his cheese sandwich. The two mice, one for each of the men, relate to the fact that it was apparently mice who were later found to be the culprits. But we need to point out that not all agree on the memorial aspect of the mice, which have apparently been decorating the building’s cornice since the mid-1800s – and there are legitimate questions: why, for example, would the Victorians when constructing the property commemorate two long dead workers and how had the story even reached them of their deaths? One theory is that the mice do commemorate two men who died in the circumstances described, but while building the property they are located upon and not The Monument at all. The building, meanwhile, is said to have been constructed as offices and warehouses for spice merchants Hunt & Crombie – it’s been suggested the mice were merely part of the decorations made for the building and not a memorial at all. Whatever the origins of the mice – and whether they represent a memorial or not – we thought they were a nice way to close out the special series on Great Fire of London commemorative sites. We’ll kick off a new Wednesday series shortly.